One of the key aspects of a successful recruitment process is understanding, managing, and appealing to the expectations of your potential applicants. When a job seeker applies for a role, they have a specific set of expectations in mind. If these expectations aren't met, they often lose interest in the role. By not understanding the expectations of your applicants, you could be actively detracting potential hires. The expectations that job seekers hold have changed over the years. As the job market changes, so do the standards that talent expect employers to uphold. 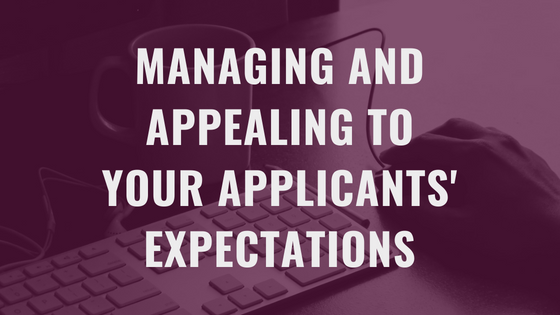 So how can you manage and appeal to your applicants' expectations? One of the main and most basic expectations of job seekers in 2018 is communication. A study by Reed.co.uk found that 85% of job seekers expect to be informed of an unsuccessful application within a reasonable time frame. What's more, 21% would expect that they've been unsuccessful following no contact within 5 days, and 90% would assume they're application was unsuccessful after 14 days of no contact. The importance of communication is clear. The number one thing that most candidates want and expect from their potential employers is clarity and respect at this stage. Talented job seekers want to know where they are in the candidate journey and how much stock to put into an opportunity. It's vital that you keep in contact with your applicants throughout the process, to ensure nobody moves on to other opportunities. After all, you wouldn't want to go to offer an interview to a top candidate, only to find they've already set their sights on another business who acted faster. And it doesn't end there. 79% of job seekers expect to be at an interview within a fortnight, whilst 71% expect to be offered a job within 3 weeks. Essentially, your entire recruitment process has to be as speedy as possible to meet your applicants' expectations. Dragging your feet too much can turn quality candidates away. Applicants are naturally going to feel impatient, they want a good job and they want it sooner rather than later. But just as you shouldn't waste your applicants' time, they shouldn't waste yours. You need to manage your applicants' expectations as well as meet them. Your prospects will be happier knowing what to except so that they can manage their own expectations accordingly. You can do this by keeping your candidates in the know. Sending confirmation and update emails whenever you can is a great way of ensuring your applicants are in the loop and kept engaged. If these can be personalised, then even better! Breaking free of automation and adding that human element to your recruitment process can help immensely in keeping your prospects engaged and invested in your company. Think about it this way, which company would impress you more; one who never replied to your application or one who sent a personalised confirmation email and followed up in the next couple of weeks? Once you understand the importance of communication and clarity, you should ensure your branding and your job ads are on point. Your job advertisements say a lot about your company, they're the first impression many job seekers get of your business, so they need to be high-quality and they need to stand out. But that's not all, you also need to establish yourself as a trustworthy company, and the way to do this is through branding. With quality branding, job hunters can see that you're a reliable company, they can see who you are and why they'd want to work for you over any other company. Branding also gives you accountability. Applicants know who you are, and that's a good thing! Making a good impression and sending a confirmation straight away manages your applicants' expectations by showing them what kind of company you are. From this, they know to expect to hear from you again, which keeps quality applicants on the hook. Ultimately, the talented individuals applying to your job role expect you to treat them with the same respect they treat you and your opportunity. They expect to have their time and effort respected, even if it's just through a simple acknowledgement; "Thank you for applying for our job vacancy, we'll be in touch within the next couple of weeks". But the further you go to meet and exceed your candidates' expectations, the better chance you'll have of catching those rare quality applicants. Managing your candidate's expectations and appealing to them is ultimately all about honest and understanding. By being honest and transparent with your candidates, as well as valuing them and their time, you can gain their trust, let them know what to expect, and create appeal for your brand.